For anyone who’s ever experienced a traumatic experience in their lives will say that’s a load of bull. BUT having gone through those experiences myself, I’ve finally come to an understanding in recent months. We as human experience loss, illness, depression, and other things that trigger the feeling of pain whether we like it or not. 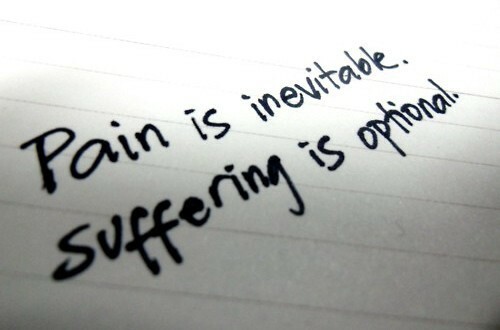 However, the idea of pain is often temporary. Say if you just lost your pet, pain only exists at the moment of shock or loss, its almost like the fight and flight reaction naturally hardwired into our brain, but this pain you feel at the moment is not meant to last. Thus you will naturally feel pain and it helps us better understand a situation just like any other emotion — happiness, sadness, fear, anger, etc… The common thread within all these emotions is the fact pain, is just another emotion, it comes and goes when you learn to let it flow naturally. How Could Suffering be OPTIONAL? I know what you’re thinking. I’m insane to even purpose that suffering is optional. Well, it can be optional if you learn to work with your own emotions and ability to process events. After we experience pain from an initial shock, how we choose to process the emotion becomes the key to why suffering is optional. Suffering, in a sense, is choosing to continue carrying the pain and the unwillingness to let it go. We suffer because we relive the pain, unwilling to accept a situation and thus the choice of fighting against what is present. Our realities never really change, but our choice in perceptions result in whether we suffer or simply accept and let go. Think about it, most of the time we face pain or loss, we have lingering feelings of what was and have trouble accepting the new reality. We hold on to the memories of once was and use that as a comparison to what is. We suffer because we still want what is no longer there. That being said, we are also our own salvation from this suffering. Human beings have a funny way of trapping ourselves into a corner. We say we don’t want pain, but we sometimes make choices that cause or perpetuate more pain. Other times, we think change will create more discomfort so we’d rather stay within a comfort zone and endure the “known pain” rather than take the risk of “new pains.” But the truth is, everything comes down to choice. No one can force another to change or let go of their suffering, it has to come from within. I want to but I can’t! I choose to not change and accept that I am the creator of my own suffering. It’s a hard pill to swallow but its being truthful about where you are at. It also opens up the possibility of one day you choose to not continue the pattern. If you simply say “I can’t” then you are not accepting the responsibility of being the master of your own universe. People fall into the trap of being defensive when they are confronted with their choice of not wanting to change. Remember that there’s no right or wrong to it, its simply a choice. The defensiveness comes from the fact they themselves know there’s something better, but if they acknowledge the fact they are their own oppressors, then it means they can do something about it . It can be terrifying that we have all the power to turn our sufferings into a thing of the past. Because it means, you lose a part of your identity. You no longer have to exert energy in fighting your sufferings and new possibilities can come through. Change can be scary, but it gives you new and better possibilities. You’ll never just stuck to one change, you can keep evolving until you are truly happy with who you are.